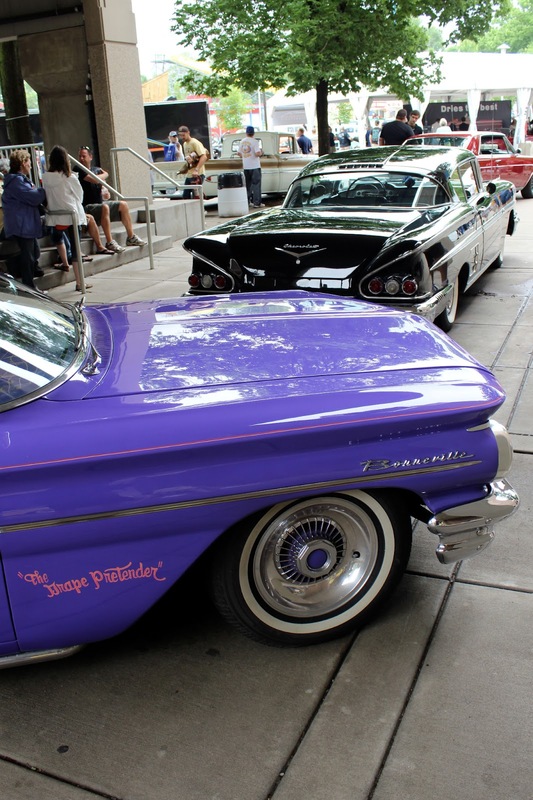 The 40th Annual Back to the Fifties Car Show was this past weekend in St. Paul, Minnesota. 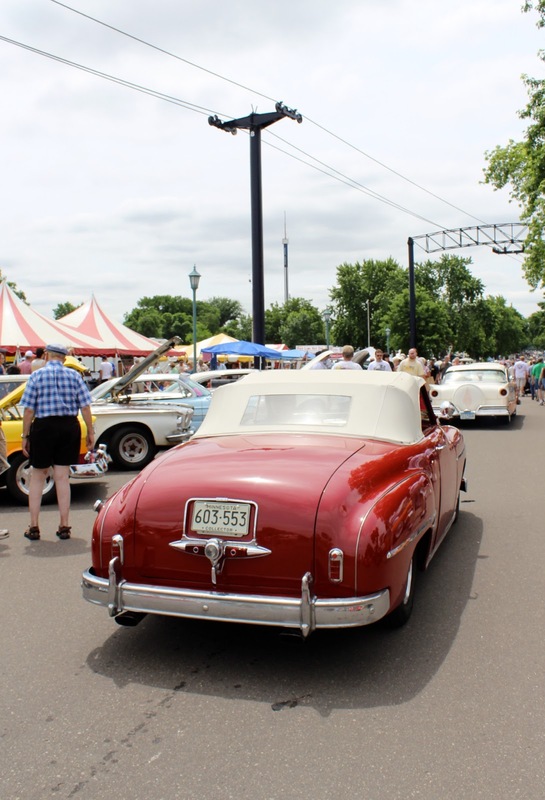 The three-day car show attracted over 12,000 cars to the Twin Cities for a fun weekend of classic cars and good times. The California Car Cover Crew and I were on hand again to see a lot of our friends from the upper Midwest. I will post some video from the show later this week. After we set up the California Car Cover booth on Thursday, the CCC Crew and I headed downtown to watch a Twins game. We were lucky that the Twins were playing a day game. 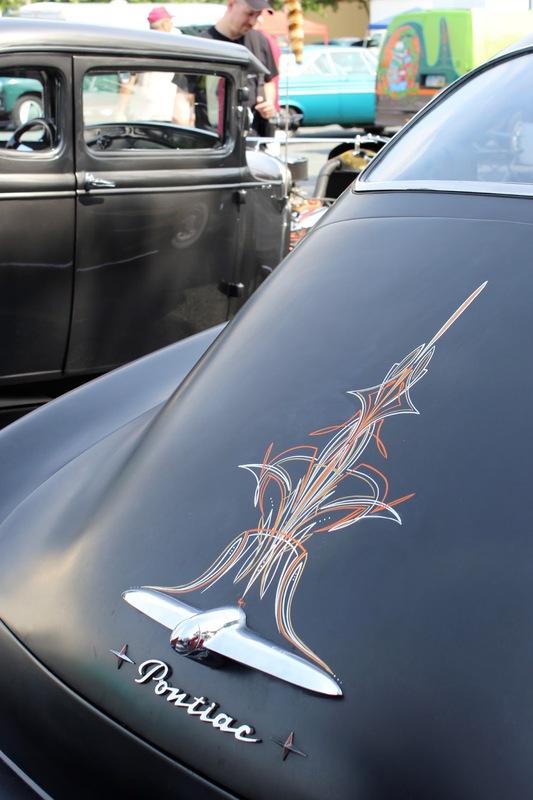 Our neighbor Coop was pin striping classic cars all weekend. He even lettered our new catalog racks at the show. 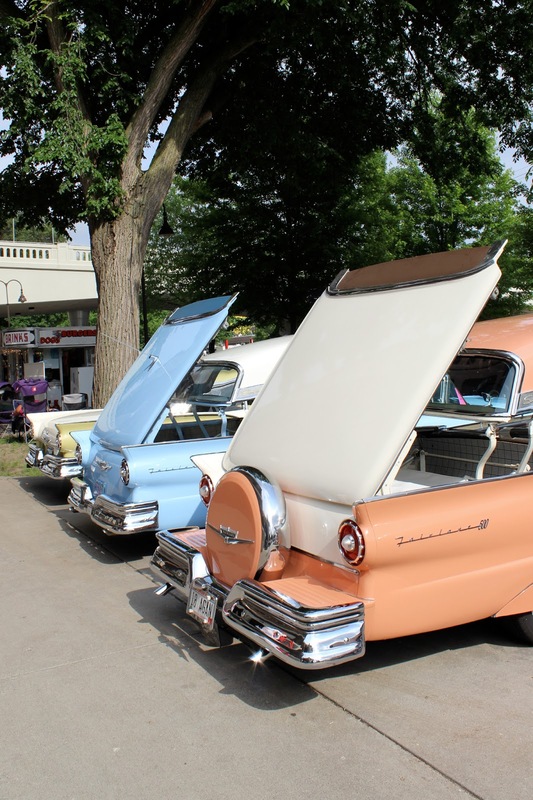 The Back to the Fifties Car Show is hosted by the MSRA. 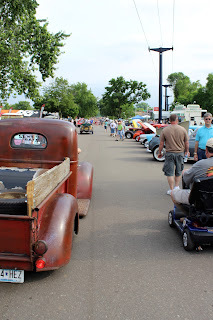 The Minnesota Street Rod Association is a great group of classic car enthusiasts. 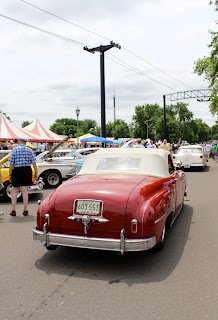 They do an amazing job of getting tons of cars and spectators to spend a weekend with them in St. Paul. Usually the weather is perfect, but this year there were high winds and thunderstorms all weekend. Even with the bad weather, the fairgrounds were packed all three days with hot rods and people. On Friday I had the chance to meet up with my friend Jerry Dixey from Street Rodder Magazine. 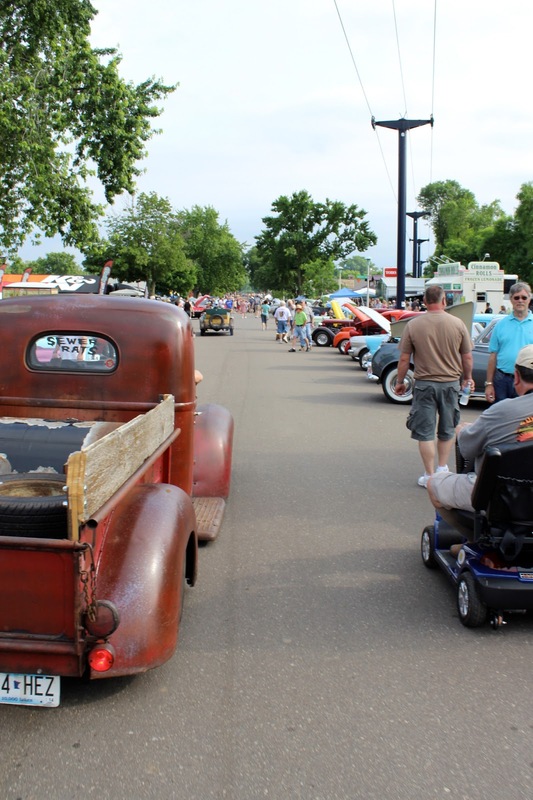 Jerry leads the Street Rodder Road Tour and one of the tour legs this summer ended at Back to the Fifties. Our car care line, Golden Shine, is one of the official product sponsors for this year. The Roths' and me at Back to the Fifties. This year California Car Cover will be giving out a Golden Shine Kit to one lucky winner on each of the Road Tour legs. Whatever car owner keeps his or her car shining during the trip will be given one of our popular kits. I was fortunate enough in Minnesota this past weekend to meet the Roths, who kept their Nomad looking great while on the road. Seeing Jerry and the Road Tour drivers also gave me a chance to see the 2013 Road Tour vehicle in person for the first time. The car was built by Honest Charley's in Tennessee. Besides providing Golden Shine Car Care products to keep it clean while on the road, the car will also be covered with one of our custom California Car Covers. Friday was a great day at the fairgrounds. Even though there was wet weather overnight, it was a beautiful day at the show. 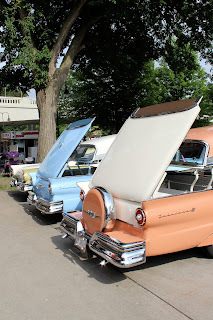 The Minnesota State fairgrounds is probably the nicest venue that we attend each year for a car show. There are plenty of food vendors, parking, shade, restrooms. If you have not been to Back to the Fifties it is a must for any hot rod enthusiast. 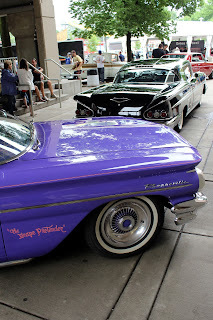 You really need a few days at the show to see everything at Back to the Fifties. Just one day at the show won't cut it if you want to check it all out. 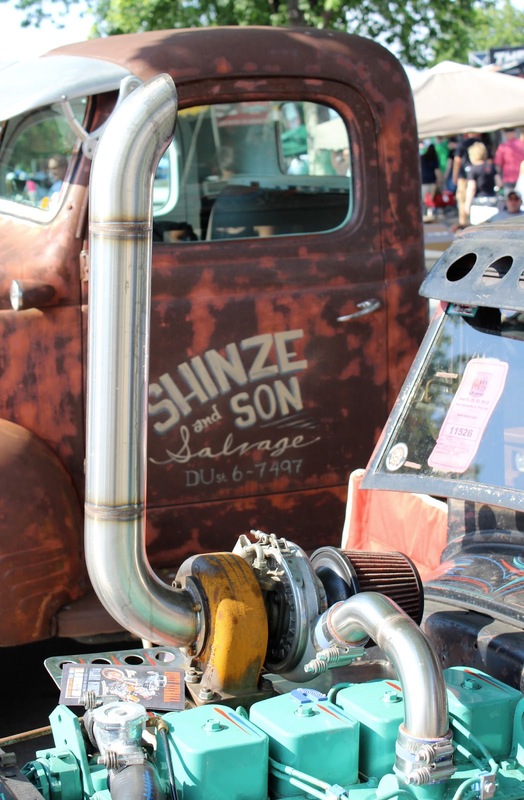 Besides the cars, there are special events, a few hundred vendors, an adjacent car auction, raffle prizes and much more. The fairgrounds are huge and after four years of attending the show I have yet been able to see the entire the place. Friday night after the show we headed over the The Nook. This burger place was featured on Diners, Drive-Ins and Dives and did not disappoint. The stuffed burgers were great and we can't wait to go back. While at dinner we noticed that the weather was pretty ugly. Before going back to the hotel we thought we should drive back to the fairgrounds to check on our booth. Even though everything was secured and covered, we wanted to double check on the trailer before calling it a night. Fortunately, we secured the booth and everything was fine, but a few other vendors were not as lucky. The MSRA team worked all night to contact and assist all the vendors that had problems with their canopies and booths at the show. They did a great job of cleaning up the place and making sure the fairgrounds were ready to go on Saturday morning. Saturday morning was a little hazy, but there was no rain by the time cars started to pull into the fairgrounds. 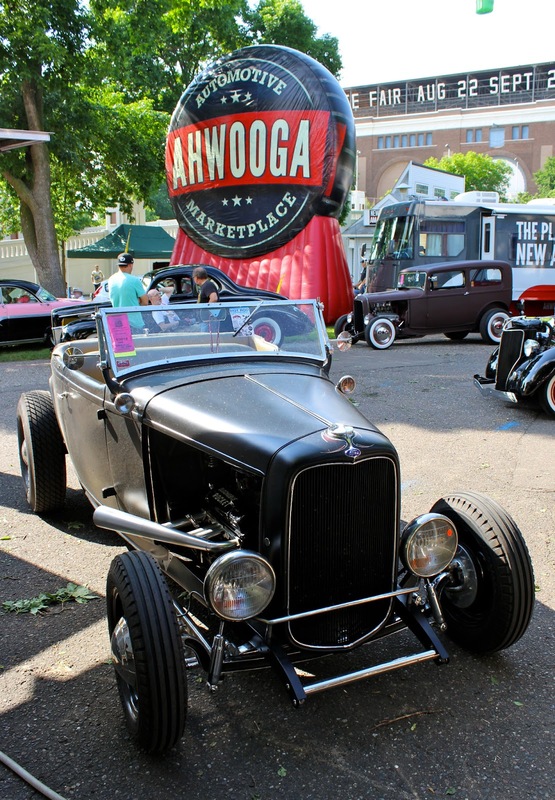 The cars kept pulling into the show and ended up being a great day in St. Paul. On Saturday morning, the drivers in the annual Great Race convened on the show. The fairgrounds was the starting point for this year's race to Mobile, Alabama. Competitors were all driving classic cars in a race to the gulf. The staging area attracted a lot of show spectators to the race track. Most of the action during the day is right down the street from the California Car Cover booth. This intersection seems to be were all the cruising cars have to pass through. A big thing at the car show is cruising. The fairgrounds has so many paved roads that most attendees drive around a few times a day to see all the action. Since I was working the event with the California Car Cover Crew I did not have a classic car at the show. The easiest way for me to get around was on foot or on the Sky Ride. A few of the fair attractions are open during the car show, include the Sky Ride. 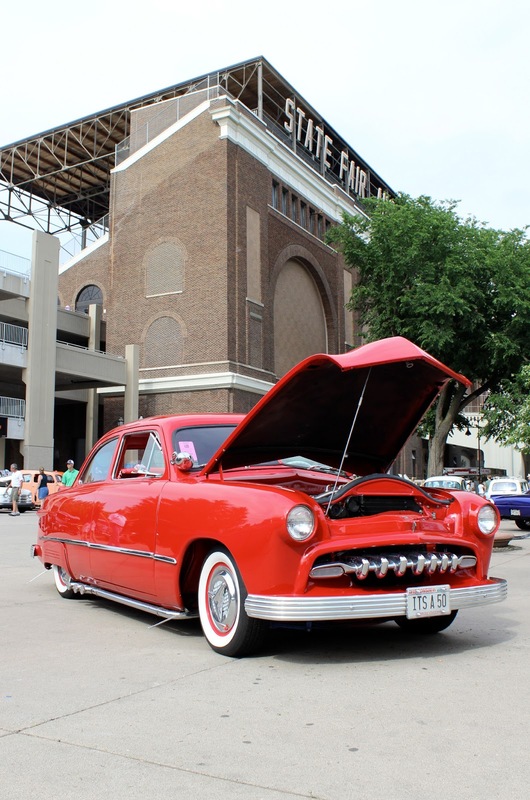 It is the easiest way to cut across the fairgrounds and get a great look at all the cars. More video from the Sky Ride will be featured in our video from the car show on the California Car Cover You Tube channel. After our annual visit to Punch Pizza and a local Dairy Queen, we called it a night to get ready for the last day of the show. The highlight of Sunday morning is the annual Swap Meet. Unfortunately, some heavy rain hit on Sunday so the swap meet was a little wet. There were still a lot of great vintage items. There were still plenty of cars on display on Sunday. Before packing up and heading back to Los Angeles, I was able to go see some more classics that were at the show. Are you on Instagram? 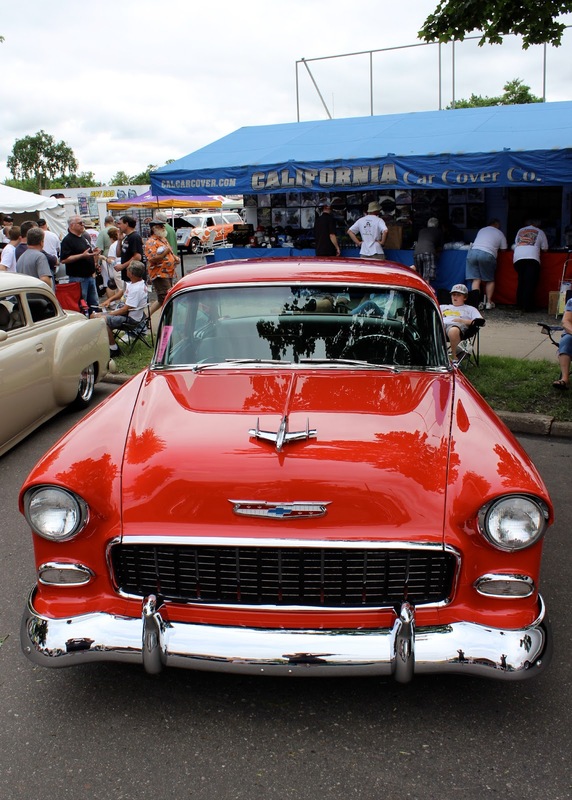 Follow the California Car Cover photo feed for great car show pics from all over the country. 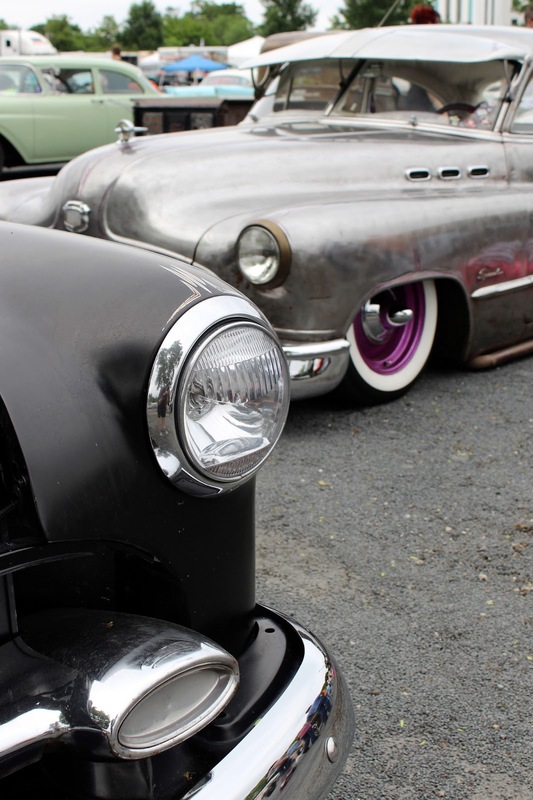 We posted some great photos from Back to the Fifties all weekend. Also on Sunday, I had the chance to meet Jerry. Jerry is member #1 from the MSRA. The MSRA puts on an amazing car show and I was glad that we had the chance to talk. Back to the Fifties weekend it was one of the premium car shows in the country and California Car Cover looks forward to being back there in 2014. Follow us on Facebook to find out where we will be next!